Kip and I have been in Galveston, TX since Tuesday. We joined our friends Ron and Barbara Spahlinger here for Thanksgiving. They have been coming to the Jamaica Beach RV Park for years. Kip and I came for the first time last Thanksgiving. We were all here New Year’s Eve, and again last summer. The park is really nice and it’s so family oriented. They have two pools, two hot tubs, tubing, an outdoor evening movie and putt putt golf. It’s also right across from the beach. The park owners fix turkey, stuffing, potatoes and gravy. All the RVers bring side dishes and desserts. After the first midday feast in the park clubhouse, the owners clean it all up and bring the leftovers out again that evening. On Friday, they make turkey gumbo for everyone to enjoy. They do this every year. So if you have been wondering why I haven’t written a blog in several days, it’s because I have been too busy eating. It hasn’t all been fun and games, though. It seems that my stomach doesn’t like being given three pieces of pecan pie in one day along with the turkey and trimmings. It felt good to take a break from all those things that tend to consume me. I love writting, but I was beginning to feel quantity was overtaking quality. I have wanted to complete a couple of writing projects and keep up with a daily story on the blog. I’ve never been very good at prioritizing, but I’m getting a little better about finishing what I’ve started. Kip and I have a big, busy family which includes eight grandkids and three great grandkids. We want to find ways to spend more time with them. My dilemmas are challenging for sure. 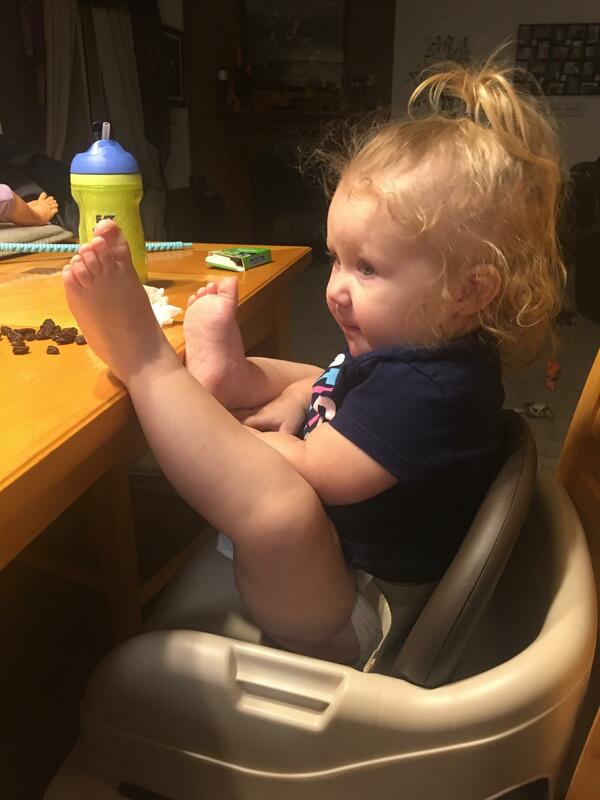 great granddaughter, Ryan Constance…eating raisins…looks like me after three pieces of pecan pie.. only she’s much cuter. I’m sure clarity will come with time. In the meantime, I want to share some ‘Thanksgiving in Galveston’ pics with you. Sunset picture taken from the ferry to Bolivar. We saw dolphins swimming. I love this picture of Ron and Barbara’s granddaughter, Kaylee, throwing pieces of bread to the seagulls. Life is good, and meant to be appreciated! Love all the pictures! Thanks for sharing your travels with us! I am happy for you that you are enjoying RV life, and hope you feel better soon. Life is good and you do seem to know how to live it. I understand the turkey as not being the only one being stuffed! Gorgeous area to be. The weather was great here too but we have no scenery. Thanks for allowing me to dream. Anytime 07…I love the beach, but I won’t go on a cruise. The thought of miles of water below me doesn’t appeal to me. Yes I do…I don’t like to fly over the ocean either. Remember when John Kennedy’s airplane plunged into the sea with his wife and her sister in it too? Did she learn that trick of putting her bare feet up on the table from you, Mary? Looks like Murdo manners!